Thankfully, though, the writing settles down once Siddhartha Mukherjee gets on to the actual content, though the style remains a little flowery. There are minor quibbles of detail (friars, for example, are described as monks) but what follows is a detailed and well-told story of the development of genetics, from Darwin and Mendel's early work to the modern medical implications and dangers of making changes at a genetic level. In fact the potential negatives of genetic theory come in early and are repeatedly stressed. 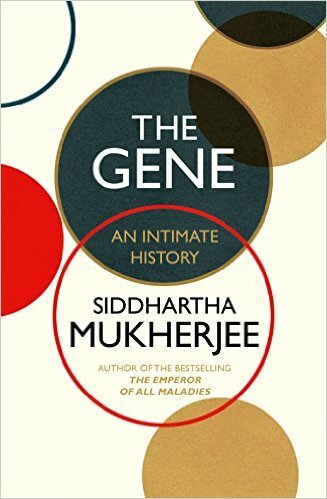 Starting with eugenics and the Nazis, that sense of threat never goes away - the reader gets the impression that at times that Mukherjee would probably rather we had never found about genes. This is the most original and strongest aspect of the book. You will either love or be irritated by the regular return to the author's family story - I'm in the second camp as it really has very little to do with science or history of science, but I appreciate it will help those who find the idea of reading a purely science-based book scary. The history of science side isn't bad, though Darwin is given a distinctly old-fashioned lone genius treatment. We are told 'The essence of Darwin's disruptive genius was his ability to think about nature not as a fact - but as a process' - but in reality this viewpoint was very much in the air as shown by Wallace's letter, independently duplicating many of Darwin's ideas, which panicked Darwin into publication. I am not doing down Darwin's contributions, which were huge - but the change of viewpoint we are told about was by no means unique to him. I was also disappointed by the lack of coverage of epigenetics, the idea that genes don't have quite the sole central importance that was once thought, as what is more important is the combination of the genes and the various external factors that turn them on and off. 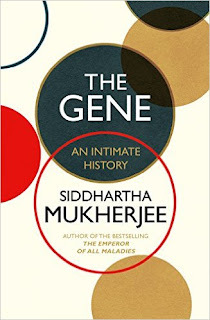 In effect we've moved on from the gene being the lone controller to a major part of a much more complex (and hence harder to explain) system.This has had a major impact in the field, but perhaps because of the book's title, Mukherjee hardly gives the concept any coverage. Overall there is plenty of material here both on the development of genetic theory and medicine and on the moral implications of such work. For me, Matt Ridley's Genome was a better backgrounder if you don't also want the medical content, and either book needs to be read alongside Nessa Carey's The Epigenetic Revolution. But there is no doubt that if you like the blockbuster approach to science reading - perhaps as something to get you through some long holiday flights - this is an excellent example of the genre.